Researchers at Cornell are working to use the same energy that drives sperm to power nanoscale robots or to deliver chemo drugs or antibiotics, for example, to targeted sites within the body. The findings were presented at the American Society for Cell Biology's 47th annual meeting, Dec. 3, in Washington, D.C.
By breaking down the individual steps in the biological pathway that sperm use to generate energy, the researchers plan to reproduce that pathway for use in a human-made device. "Our idea is not the final product but rather an energy-delivery system," said Alex Travis, Cornell assistant professor of reproductive biology at the College of Veterinary Medicine's Baker Institute for Animal Health and the study's senior author. "As a proof of principle that this kind of strategy could work, we've shown that the first two enzymes could be attached to the same chip and act in series," added Chinatsu Mukai, a postdoctoral associate in Travis' lab and a co-author. 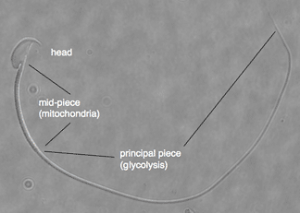 A midsection between the head and the long tail of sperm contains mitochondria, organelles that generate a cell's power. But sperm have also developed a second energy source to power their long tail. They employ a process known as glycolysis, which breaks down glucose to derive ATP, which cells use for energy. The pathway for glycolysis requires 10 enzymes. Using special "targeting domains," sperm tether these to a fibrous sheath that runs the length of the tail. In this study, the researchers are trying to re-create this glycolytic pathway by modifying each protein's targeting domain so that they can instead bind to nickel ions on a manufactured chip. So far, they have successfully attached three of the 10 enzymes required to make ATP from glucose, and each has remained functional. If they manage to attach all 10 enzymes, each enzyme will in principle act in a series to ultimately generate ATP to power a nano-device. In the body, such a device could conceivably use readily available blood glucose as fuel. Potential uses include delivery systems loaded with chemo drugs or antibiotics to target specific cells. Such a system would allow doctors to provide steady doses while reducing side effects that result from treating the entire body with a drug. Travis' group is trying to get funding to complete attaching the rest of the enzymes in the glycolysis pathway. "We have a provisional patent, so if a company shows interest, we could also work something out with them," said Travis. Since the researchers only plan to re-create the biological pathway used by sperm to create energy, it will require input from bioengineers and different physicians and veterinarians to develop viable delivery systems and other innovative uses, Travis stressed.